Many buildings in Naples are marked as the place where this or that painter, politician or poet lived. But famous crooks? I wasn't sure; thus, I wandered up to via Tasso 484 on the off-chance that there would be a plaque somewhere. I don't know what I was expecting: maybe "In this building American mobster, Lucky Luciano, lived the last 16 years of his life." No such luck. In any event, we have at least a bit in common: not only did Lucky live about five minutes from my house, but we were both born on November 11. 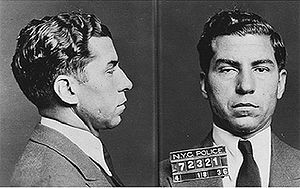 Charles "Lucky" Luciano was born Salvatore Lucania in Lercara Freddi near Palermo in Sicily in 1897. He emigrated at the age of nine to New York with his family, got started early on his life of crime and never looked back. The New York Times of Jan. 27, 1962, reporting on his death, cited an early probation report on Luciano that said, "His freedom from conscience springs from his admitted philosophy: 'I never was a crumb, and if I have to be a crumb I'd rather be dead.' He explains this by stating that a crumb is a person who works and saves and lays his money aside: who indulges in no extravagance. His description would fit the average man." Time magazine called him "...Horatio Alger with a gun, an ice pick and a dark vision of Big Business" for he was the one who turned disparate mob families in New York into a corporation-like "crime syndicate." Between 1919 and 1936, when he was finally arrested and prosecuted by special rackets prosecutor, Thomas Dewey, Luciano was involved in drug trafficking, assault, gambling, bootlegging, prostitution, loan sharking, and slot machines. The nick-name "Lucky" comes from the fact that he survived being "taken for a ride" by rival mobsters early in his career. They just beat him up and left him with scars. Although Luciano said that he didn't feel comfortable living in Italy and was even under house arrest in Naples on various occasions, his life was not all that bad. He had an apparently bottomless well of money and even looked the part of the Hollywood gangster—tailor-made clothes, fast cars and beautiful women. Though he said that he never married because "I have enough problems," he did have a longtime girl-friend, Igea Lissoni, a nightclub dancer. They were reported to have married in November, 1949, but both denied the report. She died of cancer in 1953 at age 37, leaving Luciano devastated. As the guards closed the bronze doors of the vault, a small stained-glass window in the rear was briefly visible to onlookers. It depicted a bearded saint leaning on a shepherd's staff. A newspaper man stopped [Luciano's brother] Barolo Lucania as the mourner's car was about to leave and asked him if he knew the identity of the saint in the window, "I don't know," the brother replied. "I'm not acquainted with saints." [Also see this letter from Larry Ray in his "Remembering Naples" portion of this encyclopedia.